Three versatile QTL for soybean downy mildew resistance in Japan were detected using five RIL populations and confirmed using recombinant fixed pairs or a backcrossed line. Downy mildew reduces soybean seed quality and size. It is a problem in Japan, where 90% of soybean grown is used as food. In the USA, 33 downy mildew races have been reported, but race differentiation in Japan is unclear. 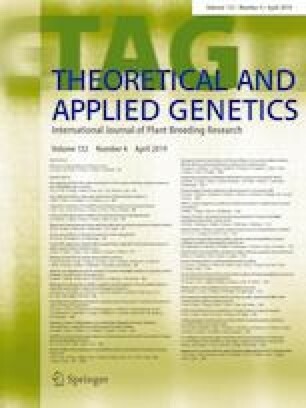 To identify quantitative trait loci (QTL) for downy mildew resistance effective in the Kanto and Tohoku regions, we performed QTL analysis using five populations of recombinant inbred lines (RILs) originated from ‘Natto-shoryu’ × ‘Tachinagaha’ (NT), ‘Natto-shoryu’ × ‘Suzumaru’, ‘Satonohohoemi’ × ‘Fukuibuki’ (SF), ‘Kinusayaka’ × ‘COL/Akita/2009/TARC/1,’ and ‘YR-82’ × ‘Harosoy’ over a 4-year period (2014–2017). We evaluated spontaneously developed symptoms of the RILs and applied 112–233 polymorphic markers to each population. Out of 31 QTL detected, we found five on chromosome 3 in three populations and another five on chromosome 7 in three populations. Other QTL were detected in one population, nine of them in different years. In the NT population, two QTL were detected in a 3.0-Mb region on chromosome 7 and in an 8.1-Mb region on chromosome 18 by evaluating nine recombinant fixed pairs in both Kanto and Tohoku regions. In the SF population, a QTL on chromosome 8 was detected in both regions. This QTL was introduced into the ‘Satonohohoemi’ background by backcrossing, and its effect was confirmed in both regions. In summary, two QTL on chromosomes 7 and 18 from the NT population and one QTL on chromosome 8 from the SF population were confirmed to be effective in both Tohoku and Kanto regions. Communicated by David A Lightfoot. The online version of this article ( https://doi.org/10.1007/s00122-018-3251-y) contains supplementary material, which is available to authorized users. This study was supported by Grant-in-Aid for Scientific Research (C) from Japan Society for the Promotion of Science (JSPS KAKENHI Grant Number JP16K07565).